Back by popular demand, The Emeralds Show and Dance Band are looking forward to ‘polkaing up a storm’ with Spruce Grove and area polka and waltz lovers. As one of our province’s best-known and beloved bands, their music has been a staple at weddings, hall parties, and school dances for many years. The Emeralds last performance at Horizon Stage was in 2012 and they are pleased to be returning on Thursday, February 5 for a special 2 p.m. weekday matinee. Since their formation in 1970, The Emeralds have recorded 29 albums - six went gold, two went platinum, and one went double platinum! They have been nominated for four Junos, won an Alberta Achievement Award, and were inducted into the City of Edmonton's Cultural Hall of Fame in 1997. The Emeralds have toured the world, from New Zealand and Australia to Singapore, Hong Kong, London, Trinidad and across the United States - but they always enjoy performing for their home audiences the most. In fact they still perform regularly at local events for enthusiastic crowds. Always fun and full of pep and energy, an Emeralds concert features favourites like “Blue Hawaii”, “Cotton Eyed Joe", “In The Mood”, “Amazing Grace”, “Clarinet Polka” and “Waltz Across Texas”. But it’s their biggest hit, “The Bird Dance”, that was featured on a Hollywood movie sound track and gets the most recognition. From kindergarteners to seniors - fans of all ages love to shake their tail feathers when they hear that iconic “na na na na na na na na”. The band’s five current members are Allan Broder (tenor saxophone and vocals), Wallis Petruk (tenor saxophone, violin, flute, clarinet, and vocals), Don Remeika (drums and vocals), Terry Kole (rhythm guitar, banjo, and vocals) and Reiner Piehl (keyboards, bass, and vocals). Together, these talented musicians will get your feet tapping, your hips swaying, and your whole body up and moving. 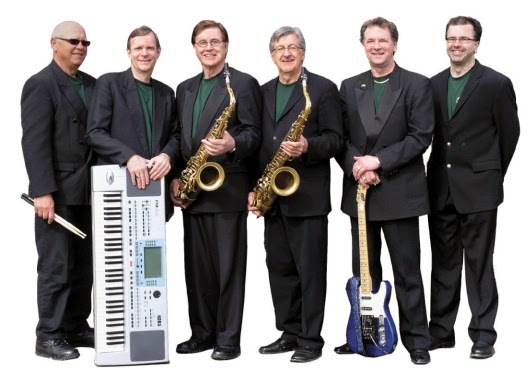 So be prepared to dance in your chair, or take a spin around the front of the stage (we encourage it), and spend a wonderful afternoon with The Emeralds Show and Dance Band at Horizon Stage on Thursday, February 5 at 2 p.m. Tickets are just $25 for all ages and discounts are available for groups of ten or more. Purchase tickets in-person at the City Hall Ticket Centre (315 Jespersen Ave), by phone at 780-962-8995 or 1-888-655-9090, or online at www.horizonstage.com as soon as possible to avoid missing out! This performance is proudly sponsored by Canadian Heritage, The Alberta Foundation for the Arts, Travelodge Inn & Suites, and Ticketpro.